When the Mac mini goes pro, will the pros get Mac minis? 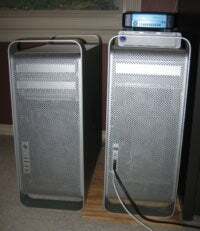 When I joined Macworld a little more than a year ago, the company offered to buy me a Power Mac G5 for handling my Mac OS X Hints duties. But since I already owned a fairly fast Power Mac—a dual 2GHz G5, actually—it didn’t make much sense to go through the hassle and expense of an upgrade for a slightly faster processor. I decided to wait. This summer, my wait paid off. Apple replaced the G5 line with the Xeon-powered Mac Pro, a machine with two dual-core processors for a grand total of four individual processing units. The Power Mac G5 has gone back to being my personal machine—the Mac Pro now does my heavy-lifting. 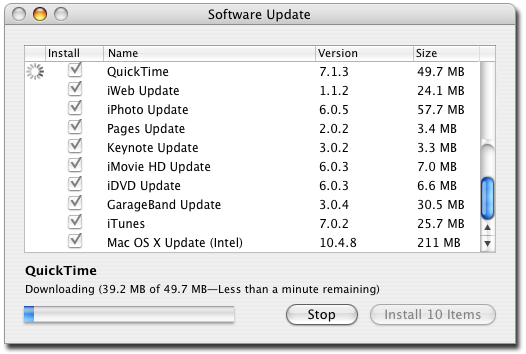 Back when I picked up a Mac mini earlier this year, I wrote an extensive three - part report on my experience of switching over to one of the early Intel-powered Macs. Given that the mini I have is on the low-end of Apple’s desktop offerings while my new Mac Pro is at the other end of the spectrum, I thought it would be interesting to give the Mac Pro the same treatment I gave the mini—a multi-part look at setting the machine up and putting it through its paces in a variety of different tasks. Let’s start with the set-up. A wired Apple keyboard and Mighty Mouse. Open the box, though, and it’s the typically excellent Apple packaging job. A tray up top holds all the software, cords, keyboard, and mouse. Remove that, and you can then easily lift the Mac Pro out of the box—well, as easily as one can lift 60 pounds. 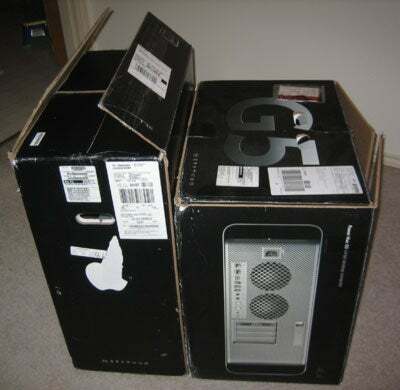 Once you’ve done that, and removed all the packaging, you can see that the case is physically the same size as that of the G5, as seen in the image at right. Inside the box, in addition to the keyboard, mouse, and computer, Apple includes the install/restore discs, a keyboard extension cable, a DVI-to-VGA monitor adapter, and of course, the power cord. Piled up next to the box, the whole lot looks rather inconsequential. The Mac Pro box is big. Really big. Hope you have a lot of closet/attic space to store it in! Unpacking the mini was actually much tougher than unpacking the Mac Pro. Lift with your legs, not your back. Otherwise, you’ll be using your new Mac Pro from the comfort of a hospital bed. After I lugged the beast up onto the desktop, I connected the power cord, keyboard, mouse, and the VGA adapter—I didn’t have a spare DVI adapter lying around when I first connected the Mac Pro to my monitor. After pressing the power button, the Mac Pro booted up quickly (very quickly) and I completed the initial configuration and account creation screens. Add those figures up, and you'll see that it comes in at over 415MB worth of data. Yikes! If you’re on dial-up, you’re looking at 16-plus hours until your new Mac Pro is ready to go. Even on mid-grade DSL, it’s 1.5 hours. Thankfully, we’ve recently switched to Verizon’s FIOS, so download time wasn’t a problem. But for those still on modems, I think this is a real issue—you’d almost have to take the machine into a dealer, or to a friend’s house with a fast connection. After the software updates (and a firmware upgrade), I rebooted and the machine ran perfectly. Ready to go to work, right? Not quite. Given that I had this great machine sitting there in front of me, and it had spare ports all over the place, I thought I should try to fill some of them up. Unlike the insides of the otherwise-identical case on my G5, the Mac Pros have a ton of room inside the case. Whereas my G5’s innards are mostly devoted to cooling fans (nine of them), the Mac Pro’s lower cooling requirements let Apple use the available space to allow for greater expansion. The RAM cards, for instance, are on two cards that pull out completely to ease the installation of more memory. 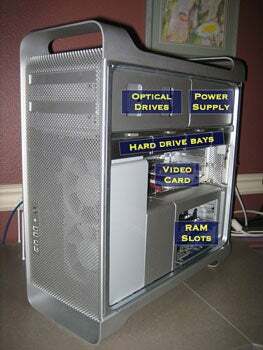 There are also four hard drive bays, and room for two externally-accessible optical drives. Here’s a shot of the inside, with the various areas labeled (click the image for a larger version). My machine arrived with one hard drive and one optical drive in place, leaving lots of empty spaces. So my first thoughts were “I’ll need more storage space,” and “It’d be nice to have a second optical drive,” as I tire of playing “Swap the CD” all the time.